Cory Stearns is a model and the principal dance of American Ballet Theatre. 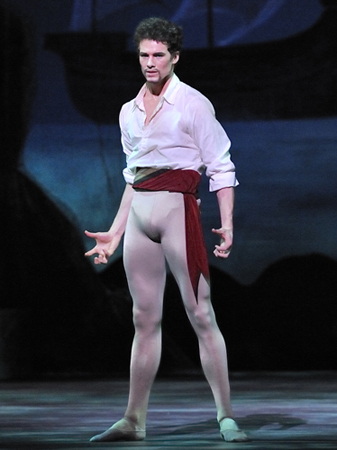 He won the 2009 Erik Bruhn Prize for best male dancer. Stearns repertory includes The Awakening Pas de Deux, Solor in La Bayadère, a featured role in Brief Fling, the Ballet Dancer in The Bright Stream, Her Prince Charming in Cinderella, Conrad in Le Corsaire, Basilio and Espada in Don Quixote, Oberon in The Dream, a leading role in Études, and etc. I met him in New York last Sept. I am glad to be able to speak to him and share with you all his stories and missions. Well, he has never thought of that perspective of selling himself. He just tries to work hard and to make people appreciate his dance and his works. X: Please tell us more about yourself. I am 26 this year. I was born in Long Island New-York and I was raised in an isolated town even though close to the city. When I was very young I started to play on starker then went to baseball and when I was 5 years old, my mother introduce me to ballet, I think she just wanted to experience something different, something artistic. She was not a ballet mom, but I think she thought it would be good for her kids. So, she brought all of her kids to ballet, brother, sister and I. I am the youngest. When I was 13, I had a decision to make. I was a downtown tennis player. I was receiving pressure from school, just to continue in sport, or maybe quit ballet cause I wasn’t sure where it could take me. So before I quit my mother asked me to participate in a ballet summer program for 6 weeks, so I agreed to do that. While I was there I was exposed to the professional dancers. There was a video American ballet of an AV tape. That video and the whole experience made me love them and from that on I decided I would be a professional. At 15 years old, I participated to a competition in New York: the American Grand Prix and I won scholarship to London, to join the royal ballet school so, I moved to London at 16 and went for ballet school for 3 years. And then, from London I moved to New York to join a company. Isabella Boylston and Cory Stearns in Benjamin Millepied’s "Without", a new ballet set to solo piano music by Chopin. X: Do you feel the responsibility is high? Yes! I feel like it is the biggest responsibility to be a principal because there will be expectation from the audience and fellows members. Actually there are having younger or older of principals, my process is rather quick but there are people who join that company at 16 years old. I joined at 19 and I am grateful for that because if I had joined too young, it would have been too much pressure for me. X: Do you feel that your mom giving you a lot of pressure? No! There are many ballet dancers who experience pressure from their parents; my mom is never like that. She doesn’t know much about ballet, she can see if she likes somebody’s style, but she never pressures me like in the movie “Black Swan”. At American Ballet Theatre, Simone Messmer and Cory Stearns perform Demis Volpi's "Private Light"
X: Can you share the hardship you went through? When I was younger, I was the only guy in my class so I really enjoyed it. I didn’t really think about the technique or the professionalism, I was young and I was just going to the class. When I became 13, I thought of putting the career of professional dancer and I started to realize that doing this profession required a lot of hard work. So, I chose to work hard. I started being teased by my high school classmates, it last for 3 years, they gave me a hard time but it never bothers me that much. I knew that they just didn’t understand what it was. And also, because at that time when everyone were in sports and I was going to ballet. It really became difficult to enter a ballet school. I was not the only guy, so I realized that I was a very small fish in the big pond, so I worked very hard and I was often injured. Then when I came to ABT it was very mental. More than techniques I really learned how to deal with nervous and stage fright, pressure. 0ver the years, I had a lot of roles given to me before which made me progress. In 2010, I had a summer season: that was very difficult and it was a lot of pressure too, but it really helped my career. That was a big year for me. X: Always a perception that ballet dancers will be only female, so that time you are only the man in the class? So what do you feel? X: Along the journey, what is the best memory for you? That Pittsburgh ballet program was one of my best memories. I had a great time and it really opened my eyes. It was the best 3 years in my life, living in London, and being independent for the first time. That was amazing. Working hard in the company and then just progressing is really rewarding and feels nice. I don’t plan anything currently, I am happy where I am I just want to continue progressing and facing challenges. I don’t really plan I prefer to follow my intuition. X: Do you intend to work in Asia country? I performed in Beijing, Japan and Singapore with the company but as I told you I have any intention to leave New York now but anything can change any second. You never know.